Ruby has had a rash on her face and neck and chest for a couple of weeks now. It started out as baby acne but then got really crazy all over her. I've been washing her face with boiled water every day and keeping milk from running down her neck when she's eating. And in the past week it has started to dry out - except it really dried out. Her poor little face was soooo dry. I've been applying olive oil (yup, just plain old olive oil) to her skin daily and it's doing wonders! She's slowly getting a clear face again. Still, all along she's been as cute as all hell. 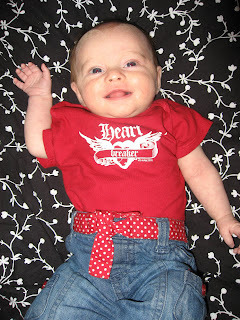 The shirt says "Heart breaker"
Thank you for getting me to get this blog into my reader. I read your old one from the eamils you sent out and I know I came here from a link about the red striped socks, but I never got you setup. And to miss all these great pictures of Ruby? It'd of been a crime. I had to re-read the sentence when you said you wash her face with boiled water. I read it as "boiling" water. heh. I read your last post about ruby falling. Momma, it's OKAY. Babies are NOT fragile. And it's better to have them fall/drop when so little when their bones are still all bendy. 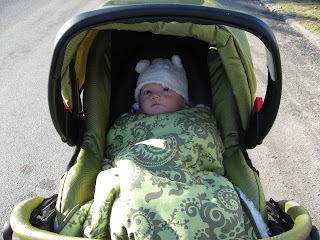 did you know in some cultures, it's good luck to have a baby fall from a bed/couch before they hit 1 year of age? In fact, if they haven't fallen, the mother makes them fall (cushioning the floor with puffy blankets or pillows) so they still get the luck? I've always known that, yet each of my babies have falled off my bed before they hit a year old. Ella was the WORST. She fell off between the wrought iron headboard and bed and was wedged in there, screaming her head off. Ugh. It happens, don't let it bother you. Really. So cute! I love the heart breaker outfit. And serious baby acne there. I'm glad it's cleared up. She's got a great smile. All she needs now is hair. 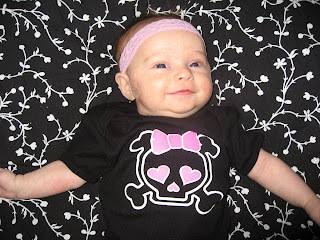 Love the skull shirt! She is such a beauty!